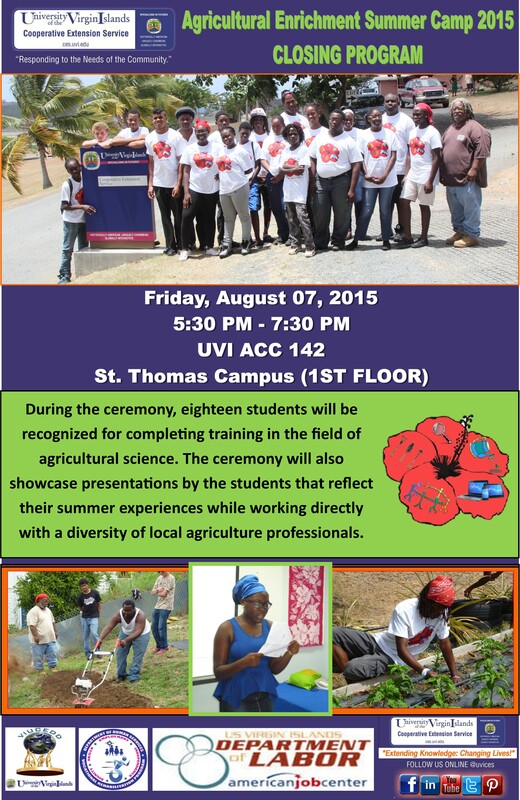 The University of the Virgin Islands Cooperative Extension Service is a dynamic, flexible organization dedicated to delivering quality, relevant programs most needed by the people of the Virgin Islands in the areas of: Agriculture & Natural Resources, 4-H/Family & Consumer Sciences and Communications, Technology & Distance Learning. Click here to find out about our current event as we also produce annual and special events including agriculture fairs, farming related conferences, Woodworkers Expo, Beekeeping Conferences, Batik Exhibits and more. Follow us on Facebook, Instagram, LinkedIn and Twitter to stay updated. Tune in and stay up to date with 'What's Going On @UVICES' on our Weekly Radio Program Wednesdays from 3pm - 4pm on WUVI. Click to listen to us live. Connect with us online @uvices on Facebook, Twitter and Instagram. Stay connected with the AgFair online! Join the Facebook EVENT for updates. Search and post using #sttstjagfair for pictures, videos and the latest information @sttstjAgFair on Facebook, Instagram and Twitter. Here's a sampling of what else is being published and broadcast about CES in local and national media outlets.